At last Beaujolais is making a comeback with more focus on quality and authenticity – and a move away from bulk production. 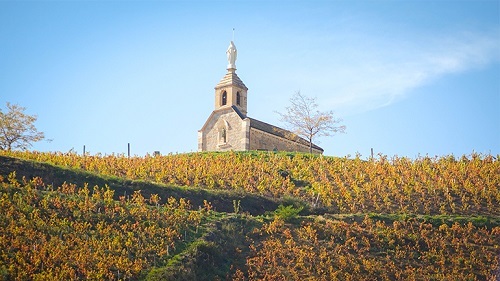 If you like silky supple perfumed reds, Beaujolais’ ten cru villages can offer fabulous value in comparison to its northerly neighbour Burgundy. 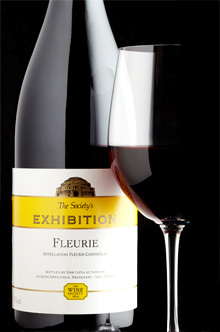 One of the most charming Beaujolais crus is the evocatively-named Fleurie. It has a softness and lightness of touch which makes it particularly appealing and approachable in its youth, in comparison to sturdier crus like Moulin a Vent or Morgon. Interestingly when Fleurie is made from vineyards near to these crus the wines are fuller flavoured, whereas wines from around the Fleurie village itself are lighter and more floral. Fleurie gained its name from the Roman general Floriacum and its first vineyards were planted in the early Middle Ages by Benedictine monks. It was expanded in the C15 by the bourgeoisie from nearby Lyons and today has 890 hectares making it one of the larger of the cru villages (the whole Beaujolais appellation has 18,500 hectares). 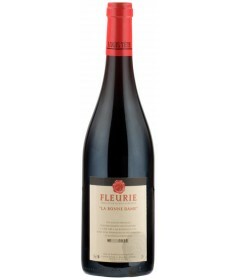 Like all red Beaujolais, Fleurie is made from the Gamay grape at its best grown on granite. In its youth it has attractive raspberry, violet and cherry notes with subtle earthy granitic undertones – but with age it can develop wonderful farmyard notes and layers of complexity, not dissimilar to Pinot Noir. So if you are a Burgundy fan, look for mature examples. What I also find with Gamay is a hint of bubblegum and peardrops in some younger examples, which often derives from the special winemaking method used in the Beaujolais region, called carbonic maceration. To enhance colour, aromas and softer tannins, this special method entails fermenting whole grapes and bunches without breaking their skins enhances aromas. Some wines in our tasting were made from partial carbonic maceration, blended with wine made in stainless steel. The best Fleuries are often finished in oak with maturation in large oak foudres, which does not add oaky flavours but softens the wine’s texture and adds complexity. Fleurie is currently very undervalued – Beaujolais was in the doldrums in the 1980’s and 1990’s – but is only now resurfacing. This fact has not escaped the notice of both Burgundian and Rhone producers who have taken the opportunity to invest in the region. One such example is Maxime and Antoine Graillot from Crozes Hermitage in the northern Rhone. They recently bought 8 hectares in Fleurie and the other popular Beaujolais cru, Saint Amour (this enterprising duo have also invested in vineyards in Morocco too). From Burgundy, Frederic & Chantal Lafarge from the much sought-after Volnay domaine in Cote de Beaune embarked on a new venture making very attractive Fleurie from their newly-purchased 4 hectare vineyard, which includes the high altitude old vine plot of Joie du Palais. Another interesting aspect of Beaujolais is that this region is also home to some of the most passionate young ‘natural’ winemakers. Julien Sunier based in Avenas is a name to watch in Fleurie making wine with real regional personality, focuses on ‘natural’ winemaking and practices biodynamic viticulture. Other ‘natural’ winemakers here are Damien Coquelet and brother and sister duo Camille and Mathieu Lapierre of Domaine Marcel Lapierre. Many of the new enterprising winemakers are under 30 years old with energy and passion, often focusing on individual parcel bottlings, which is great news for a region undergoing revival. In Fleurie the vineyard names to look for are La Madonne, Poncie, Clos des Moriers, La Roilette and Chapelle des Bois. There are of course old timers in Beaujolais too, like the Tete family who have been making wine here since beginning of the C19. Their Fleurie vineyards have perfect southern exposure so are particularly plummy, rounded and ripe – and their deliciously zesty Gamay was a clear winner in our tasting – and was not even the most expensive. In terms of vintages, many in our tasting came from the challenging 2017 vintage, where hail and drought caused problems for growers across the region. If you can find more mature Fleurie from 2016, 2015 and 2014 snap them up. They were all good vintages, with the perfumed fresh vibrant 2016s, rich generously fruity 2015s and elegant 2014s. So what do you serve with silky perfumed Fleurie? It makes an ideal partner with alfresco spring and summer dining or a simple bistro dish. I love it with charcuterie, coarse pate, cold chicken cuts, gammon, pork, seared tuna, salmon, salads or just a simple mushroom quiche. Bright fresh juicy example with appealing blackberry aromas, initially soft and ripe, but with a slightly peppery finish. Probably the best known Fleurie label; silky, soft, but quite simple in structure and fruit concentration compared to others in our tasting. Very popular with tasters for its violet and cherry aromas, bright and racy with all-round juiciness and approachability with its soft silky texture and delicious dark chocolate notes. Cuvee Tardive is a serious robust Fleurie from 60 year old vines grown on limestone. Loved it smoky notes and juicy red fruits, but it should improve with age. The Graillot family’s organic Fleurie has deep dark fruits with tea leaves & herb aromas with tangy fruits, a minerally core with lively acidity. From a ‘lieux dits’ (named site), this is dark, serious and savoury with structure and quite grippy tannins 9 months in wood; currently too young to drink, but should improve in bottle. Showing very pretty maturity with violet aromas, minerally core and firm gripping tannins which needs more time in bottle.